Well there has been a little progress today. Whilst out the other day I noticed a skip with some board that would make some good Shuttering for the foundations, so this morning I went to ask. Skip still present thankfully. Good haul I thought, loads of Bricks in it as well. But think I am OK for Bricks. This is the view from the other end and shows the Shutering in Place but also the Dodgy Step Over I am working on to eliminate. The Track around where the Green Bucket is being the impossible to get at to clean without the Step Over. View from the other end again. Now with the first layer of CarpCrete. CarpCrete is a mix of the Sifted Stones, some very fine Sifted Earth and Cement at about 3/1/1. This was what had been dug out as I cleared the site on the first day of this work. Mixed not too damp and I noticed it was drying very quick, so the next Bucket Full was mixed good n sloppy. 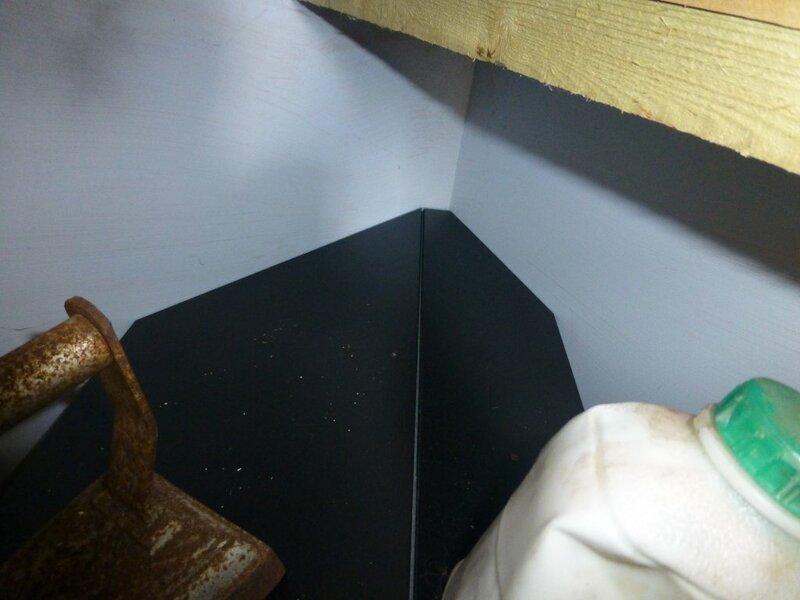 Proper Ballast will finish off the first level of Foundation. Nothing goes to Waste around here. Some more foundations will go in Left to Right for the Steps. Carpcrete? Sounds like Industrial Strength Rowlands mix to me!! Could be, have used it before and works fine for lowish walls. But I would not use it for a House or Garage Foundation! This latest project has moved on much faster than I thought it would. Guess the fair weather and not too many visits to 1ft to the Foot lines has helped. 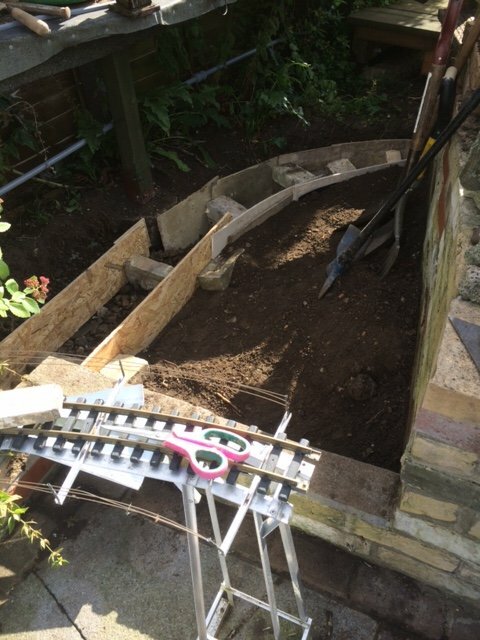 The last few shots showed Foundations in place, now we are completed except for Wire Brushing the Mortar (this mornings quick job), filling in with earth, some concrete mountainisation and planting out. Later this week all being well. 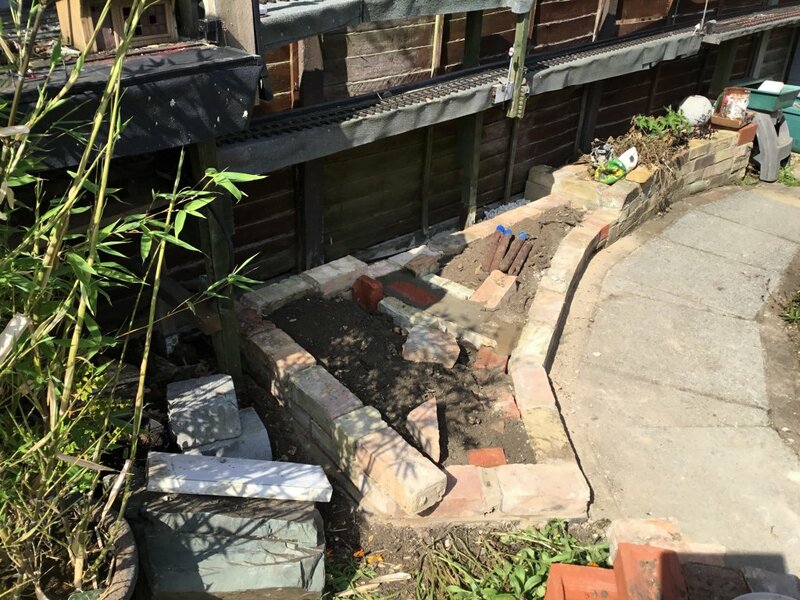 I lucked out with some Free Concrete Blocks, most of them are hidden but the odd ones in view will get a Conctere Makeover to give them some Strata. A few left over Rocks from last Years Project have been finally used up. All will be softened once planting up has taken place. Below view from the other end showing the walking route int for Track Ckeaning. 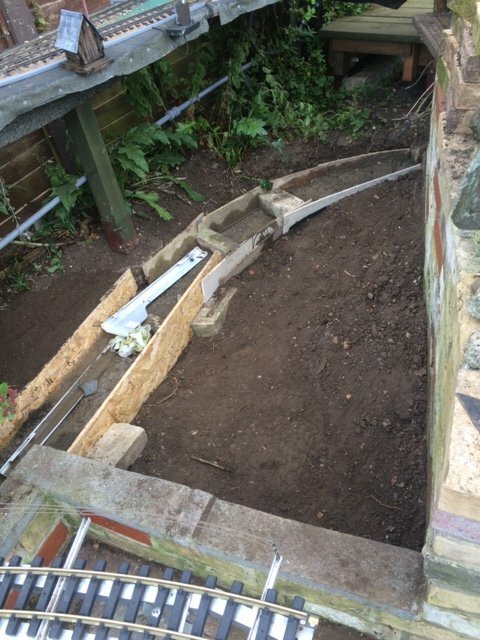 The holes in the first Flag will be filled with soil and planted out with some kind of Rockery Plant that likes a well drained Sunny Position. This will be another easily managed site and easy to get at. 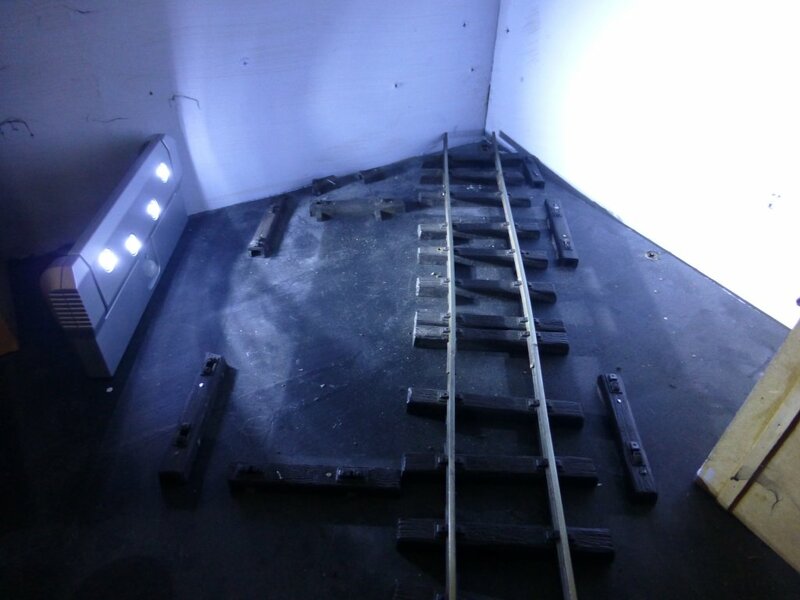 Plus Track Cleaning in the previous difficult to get location by the points will be a breeze. Morning Casey, you are up and about early this morning. I had one of my woke at 0300 and could not get back to kip so made a cuppa and did some posting. Garden Job above was sorted yesterday afternoon. 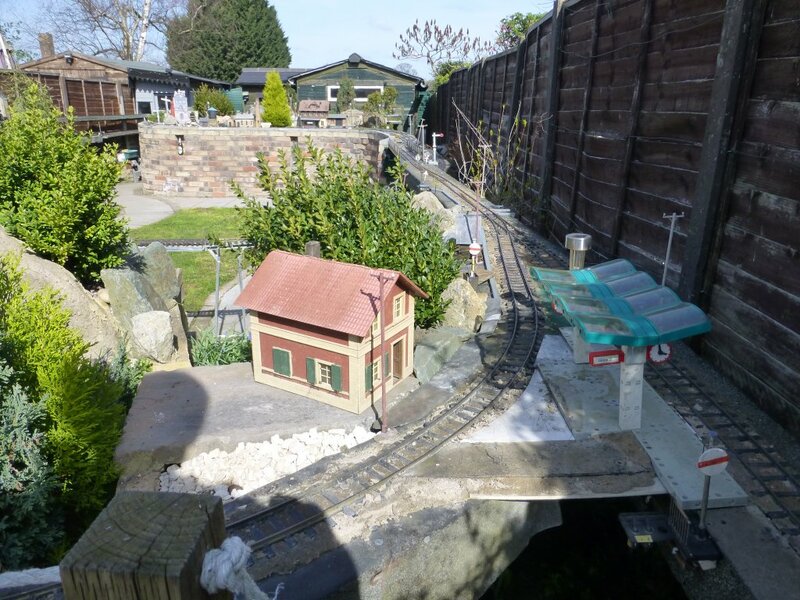 Next after few odd bits done is to get started on the Front Garden, no not for more Trains but to make it Low Maintenance. 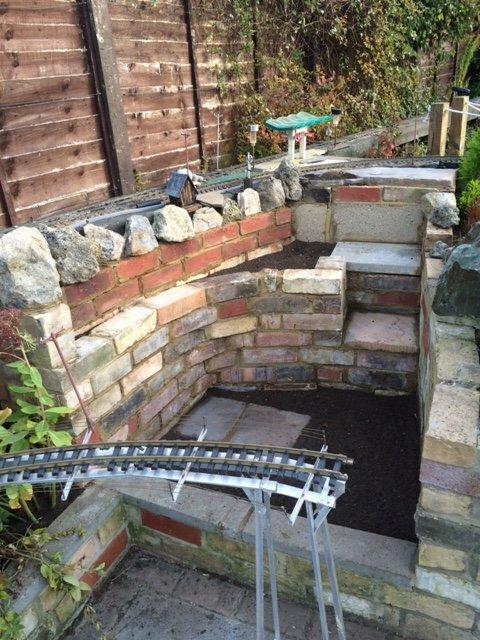 Then I have a rockery to build in North Cambs. I am supposed to be retired! I have to be out and about early this morning on non related CFR stuff. Managed mire than I thought yesterday, Earth now in so progress very satisfactory to date. 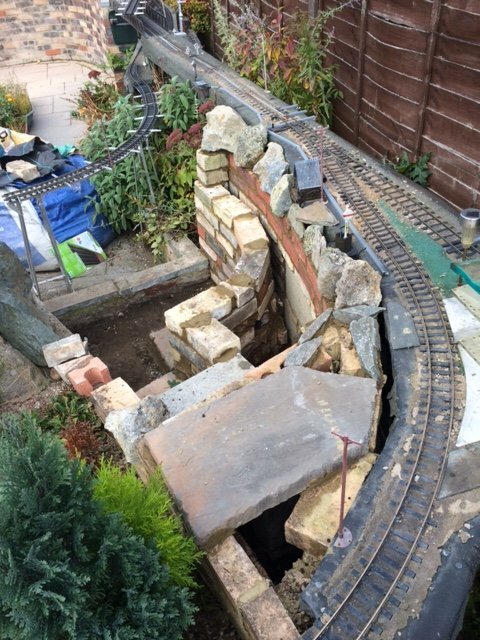 So I have been working some more on this in between starting my Front Garden Non Railway Makeover. 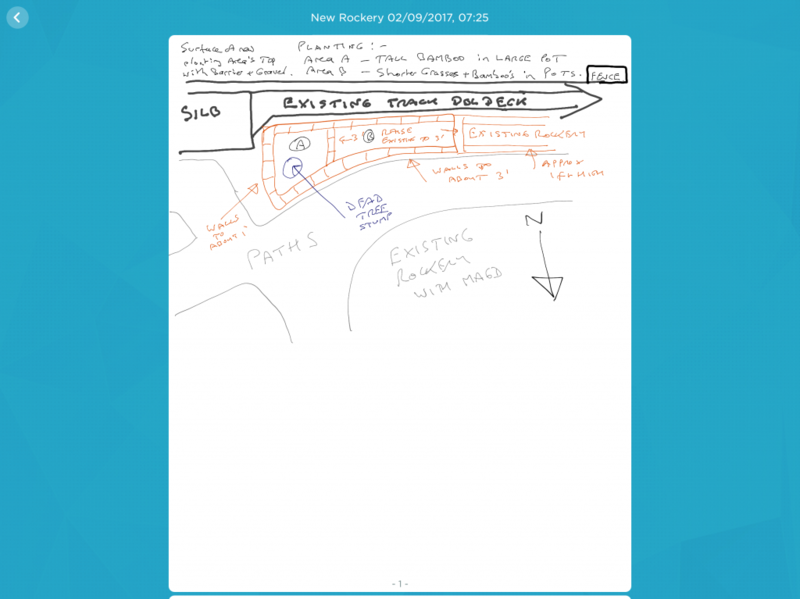 Looking back at my Post #144 where the Diagram of what was planned was shown I see that this Project has been in progress for just over a Month now and is pretty near completed. Note that the Plan was not fully adhered to! 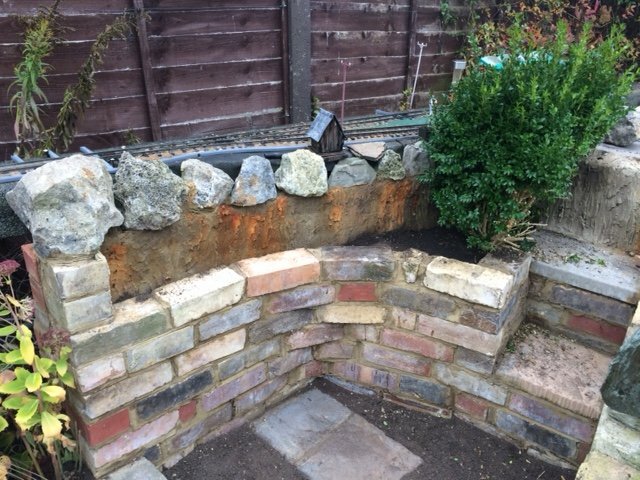 I decided to Mountainise some of the Brickwork with my usual method of Sharpe Sand, Building Sand, Cement, Washing Up Liquid and some Waterproof PVA. Mixed 2/2/1 with a good dolop of PVA added plus a few splashes of Washing Up Liquid mixed to a fairly Dry but Stickably Wet Consistancy? 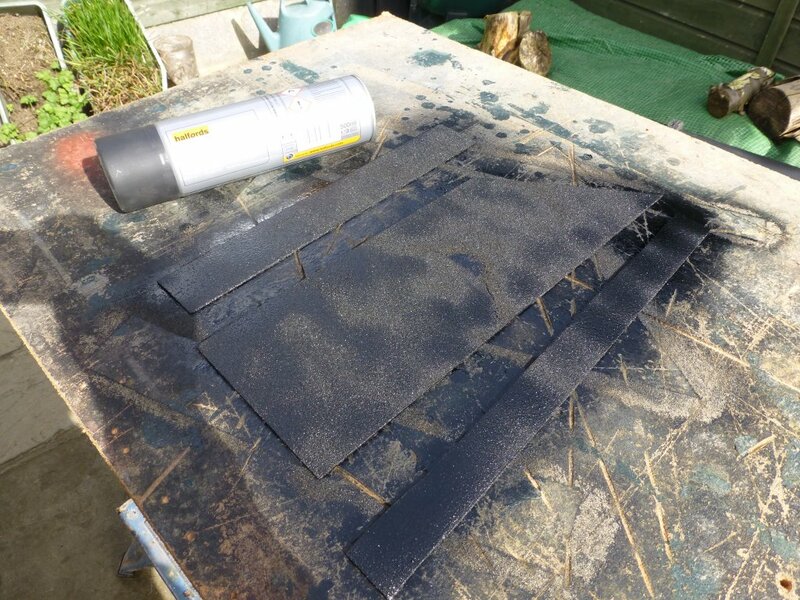 I spray the Bricks to get them Damp with Water mixed with a little Washing Up Liquid. This helps the mix adhere to the Bricks. I dab the Cement on with an old Plaster Tool about 2 inches wide, this has been well used and the corners are now rounded off. Inherited from the Ruschbahn. Finally when dry I wet the now Mountains with the Wash Up Liquid Water again and put some Iron Sulphate on the Mountains (this is used for feeding Azeleas etc and obtainable at Garden Centres), after a day or so this makes the Mountains Rusty or Brown. Use this with Care and do a little at a time, you can always come back to do more. Oh wear some Plastic Gloves when applying. The pics show some of the varying shades achieved next to some Concrete not attended to just yet. Pics show the effect as now with some limited Planting, probably wait till next Spring now to complete planting out. 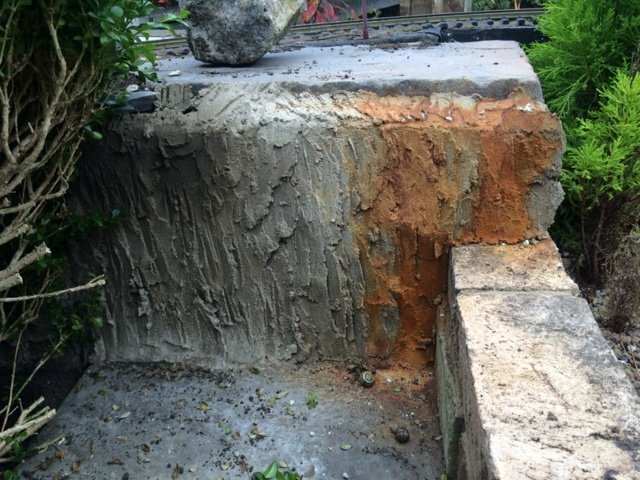 This rusting of Concrete Mountains is not an original Dunny Trick, learnt many Years ago from Bob Kelly in Florida. But use with care, it is not undooable and the Packet warns to keep it clear of Paths. 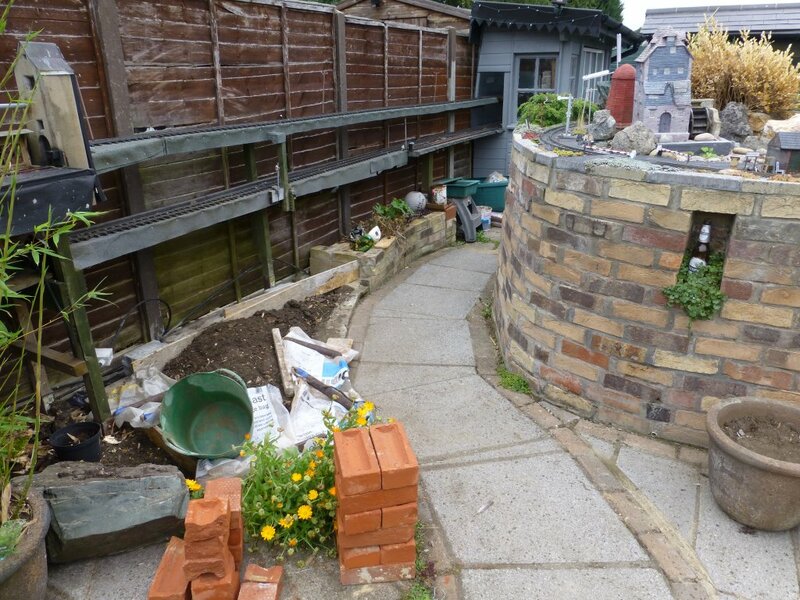 I think that the above Pic illustrates quite well the effect on Paving Flags and Bricks! Think you may have got into the post as I was editing, the description of how is before the Pictures Alan. How well does the colour last? - I presume it will mellow over time? Does much of it leach out, at all? I have use this process on my last line and it never showed any signs of changing over some 10 Years life. 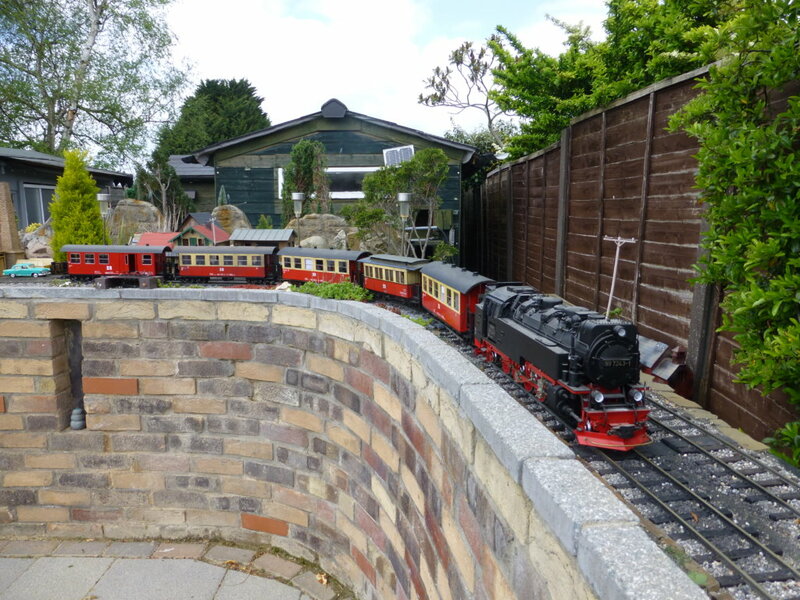 There are some section that can be seen in the pic below (just above the 3rd to 5th Coaches behind the Loco) that is around 2 Years old now and again it has not changed to any noticeable effect. Of course if you were not happy with the Colour you could always add some more. But start less and build up the effect. It does Colour up within a few Hours. The effect as you dampen is to go Green then Brown. Experiment to find the effect you like. Thanks for the info, Jon. I managed to do a few more jobs to tidy up last Winters project. 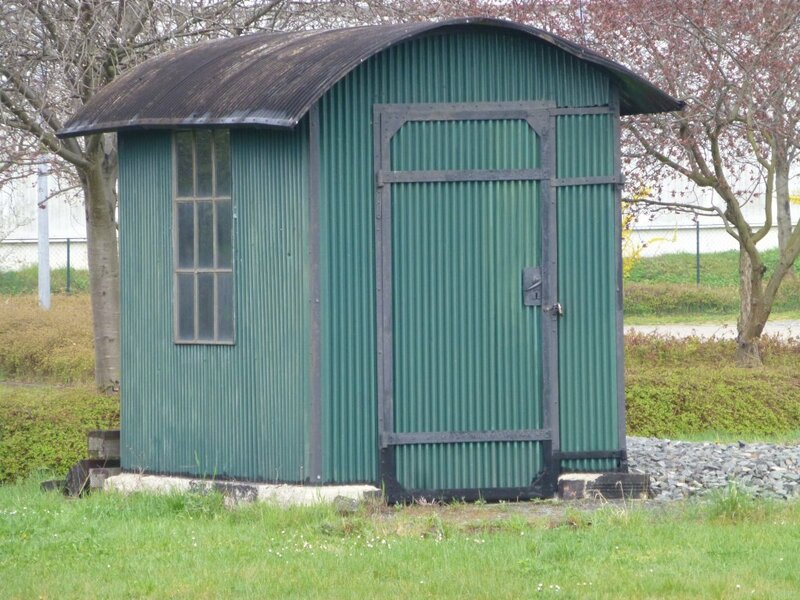 The building was in the Tin Shed which is Gernrode and needed to be moved. So I have placed it here as it is pretty well the only spot I could find for it. 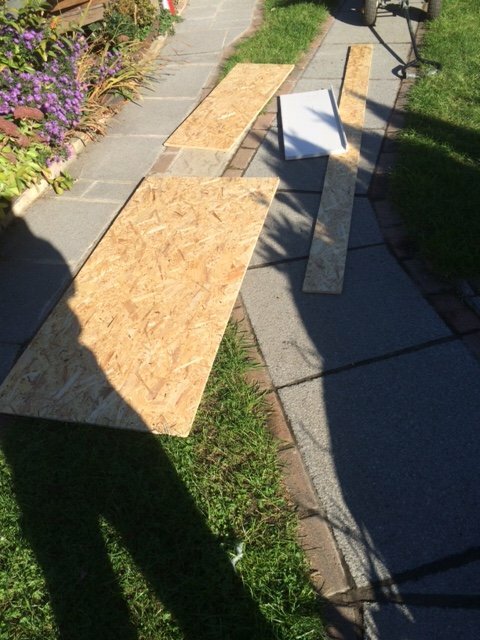 I have used my standard method of fitting which is some ally angle with some pins in to keep it in place on the paving slab. Still enough space to step by it to get in for Track Cleaning. A bit more planting has occured here, Mind your own Business by the box and some sort of plant given by a friend to the left. Well 2 of them, judging by the way that they fill in at her garden they should look good when established. Bottom right just under the final step is a baby ground hugging Conifer. All finished off with Mulch of stones on top of Barrier for ease of Maintenance. Alpine Pink on the High Level and White below. Loads of this to use up from the Front Garden Project. 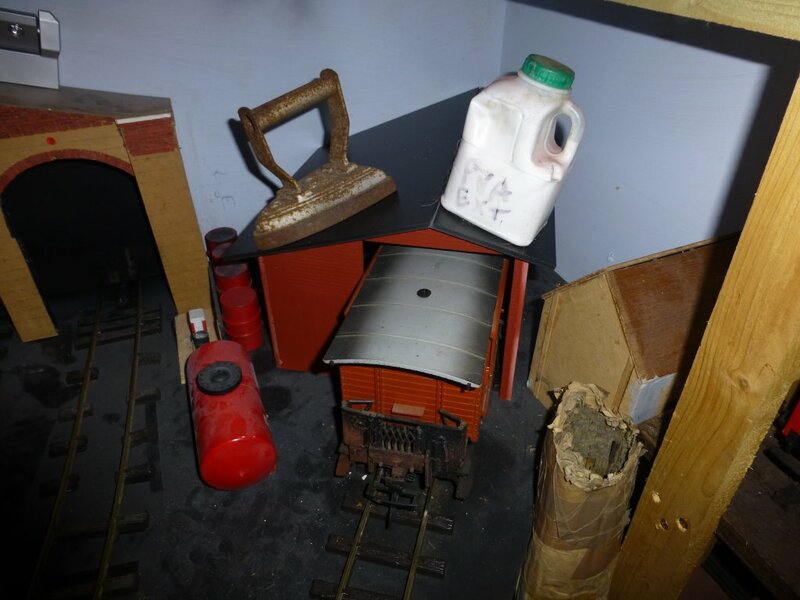 Pic below shows where the Building was in the Tin Shed. Had to be moved to accomodate an extra siding. It was the old Station Masters house at Millisee on the Ruschbahn. 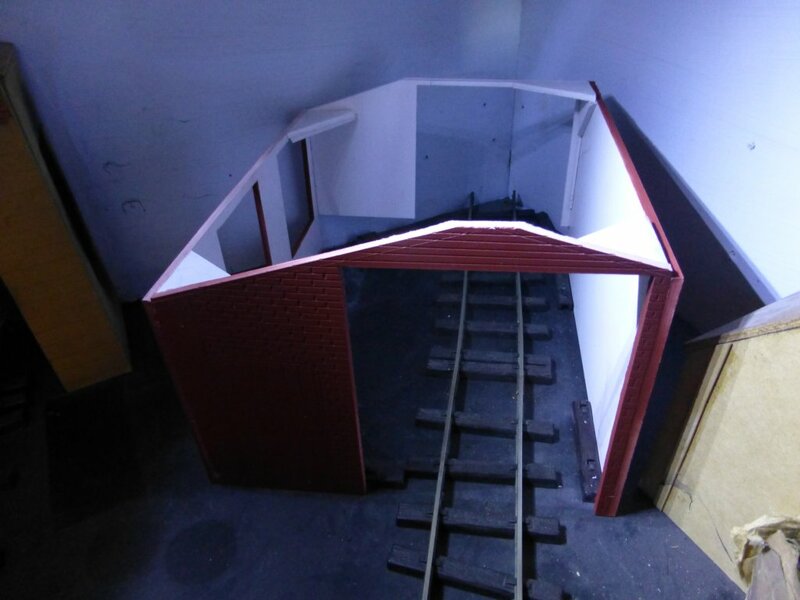 Will be making up a facsimile of the Carriage and Wagon Works from Gernrode to fit in here. Right into the corner. 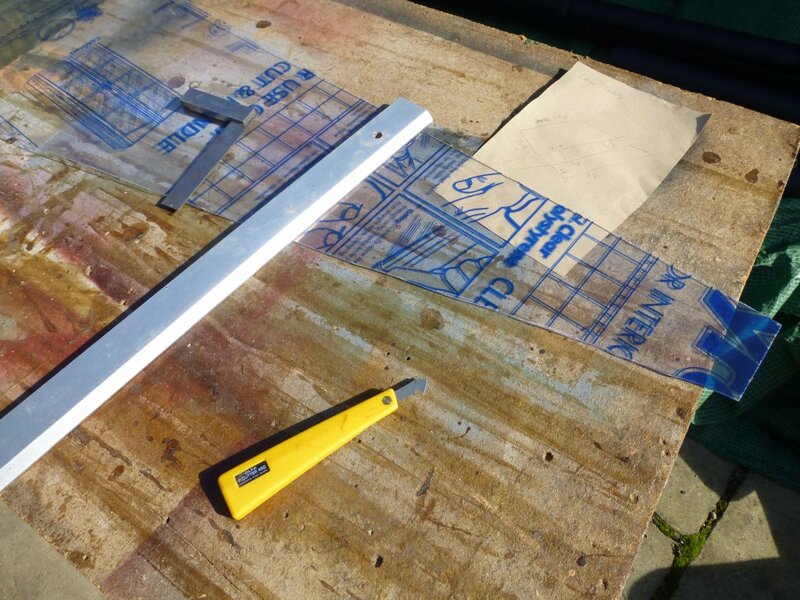 Will be a bit tricky to make with some precision measuring required in the Angles. There may be trouble ahead! This is what I will be trying to represent in this corner, but one opening only though. More coffee stirers and hips will be used for this one. One of these seen at Gernrode might be nice somewhere. I have already done a smaller version of one of these in Grey. Another job for some of Sheeba's old Dog Food Tins me thinks. Another new Rockery has been started, this time at the other end of Silberhutte Station. The site was the location of a largish tree that got chopped in the early days of my residency, trees and Garden Railways are not good bed fellows in my humble view. 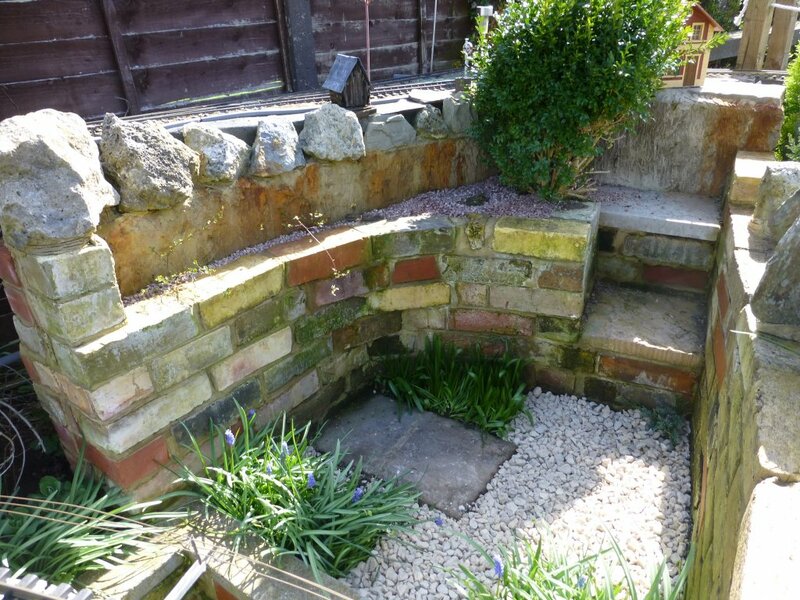 So after having a pot on it it has rotted down nicely so it is time to do someting to up the area somewhat. I do miss the height of the tree aesthetically so a tall Bamboo in a pot has been resident on the stump for just over a year now. As this is what I call a demon Bamboo I.e. very spread it will be retained in a large pot. But this will be a little higher than the stump, perhaps a foot or so. 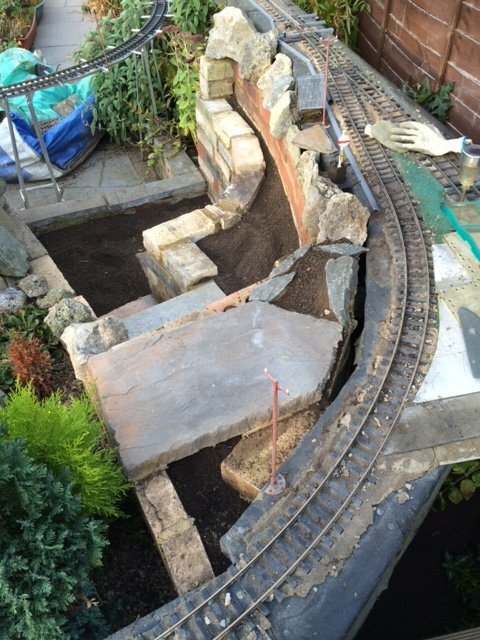 The rest of the Rockery will be almost to the lower Track Height to give some feel of planting in this tricky to scenic area. 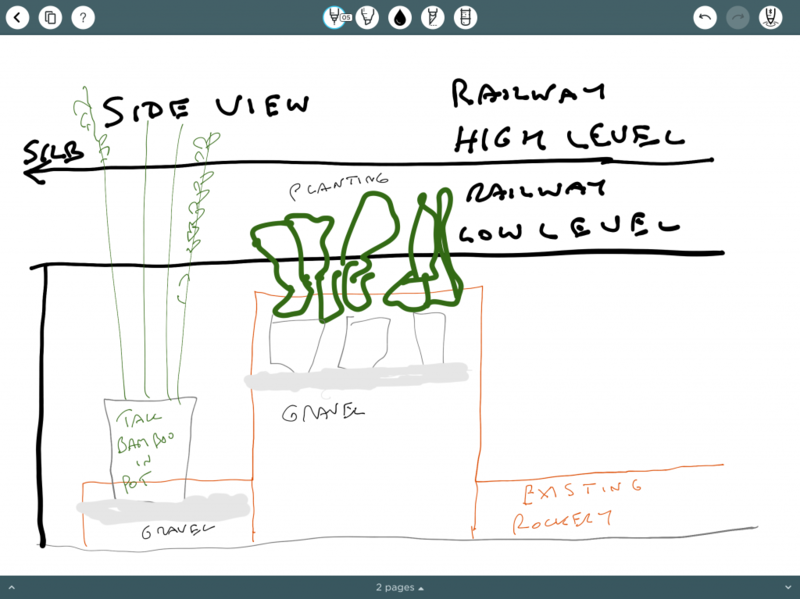 I think the diagrams and pictures should show the concept. Pic showing the site after the first bit of foundatiin has been laid to the left. The double decking can be seen with silb to the keft and Magd to the right. The Bamboo is just seen to the left. 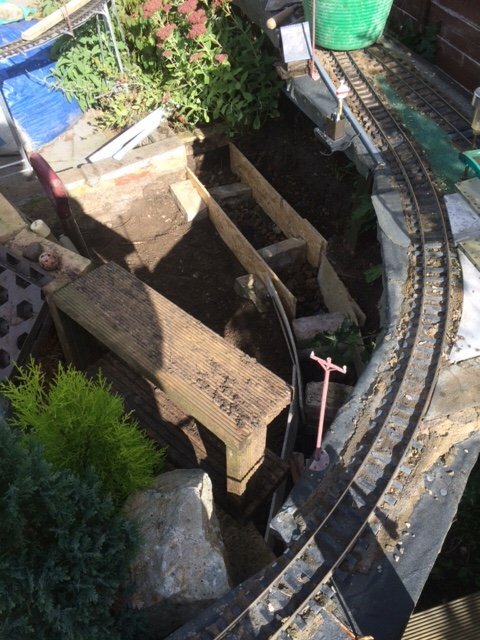 The bamboo pot can be seen middle distance below, the wall nearest camera will be raised to just below the Track Bed so that plants can disguise the area somewhat. 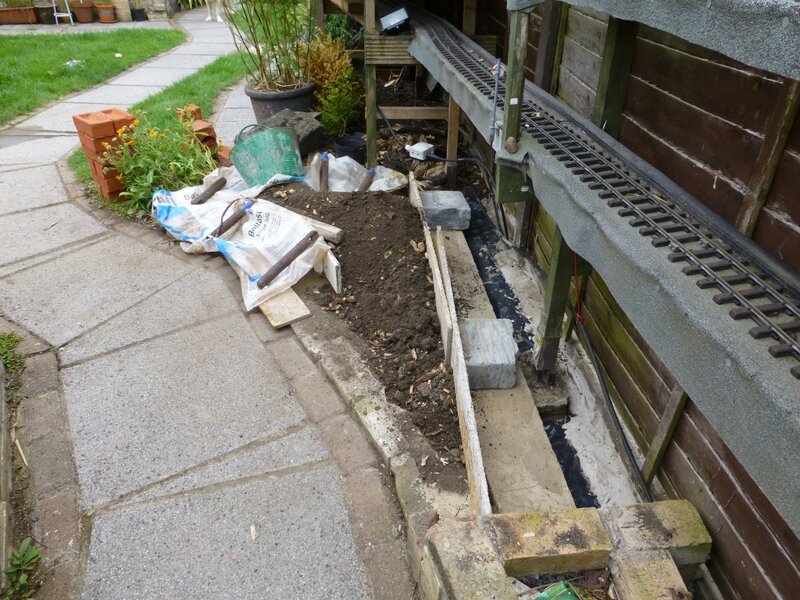 Further back around where the green pot is the wall will be around a foot high giving some severe screening to the railway but access will be available to clean the track. 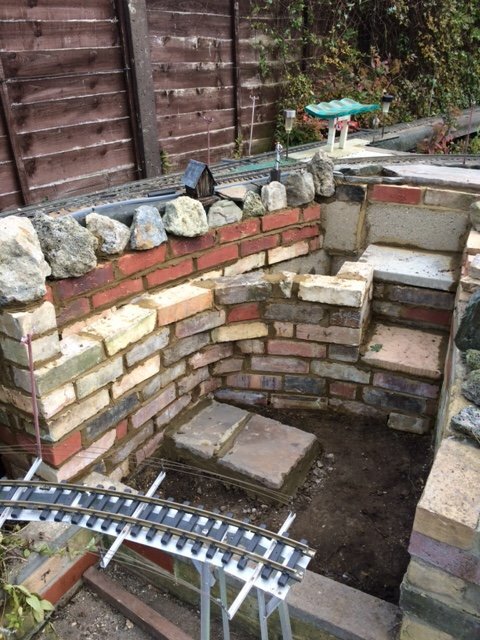 I have only a few bricks at the time of this picture (60 or so), but yesterday managed to recover some 240 or so bricks from a neighbour who is moving so there may be enough for another project after this one is finished. Site at close of work today, middle foundation has been put in and yesterday's bricklaying can be seen. Not sure what will be done tomorrow as rain forecast, we she'll see. Plus I only have 1 bag of Building Sand and tend to only buy on Old Gits Day at BnQ. By the looks of the site in front of the new foundation there will perhaps be room for another pot, perhaps a low Bamboo as well. 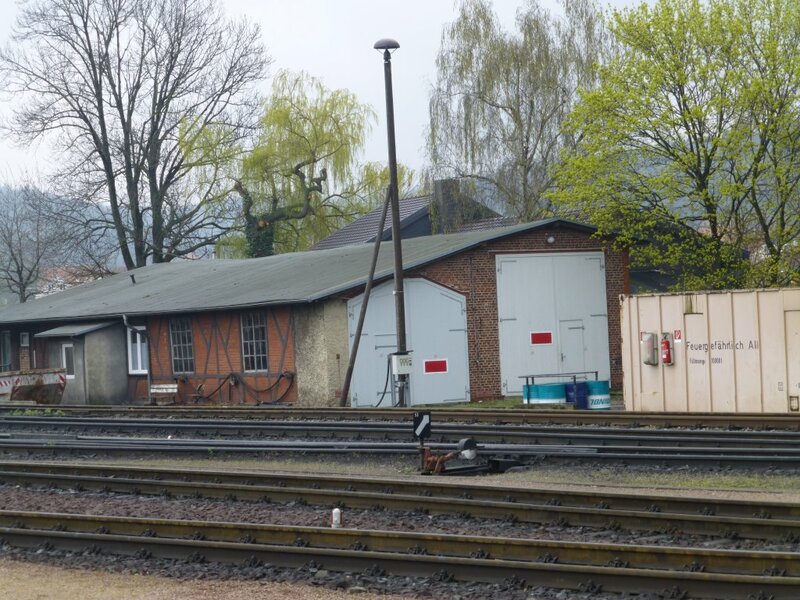 Gernrode is getting its new Workshop (well that is what I think it is). Please refer to the penultimate pic on post 162. This building has been in my mind for a long time so I finally got around to it a bit more this Friday. In truth some months back I roughed out the size using some Cardboard which has been littering my Lathe since then. So Friday Hips started to be cut and checked out for size. Come Saturday I started the process of cutting out the Windows, impressing the Brickwork and where the Timber Cladding would go. Note that as with Alexisbad due to the limitations of the site this will only be a characture of the real thing. 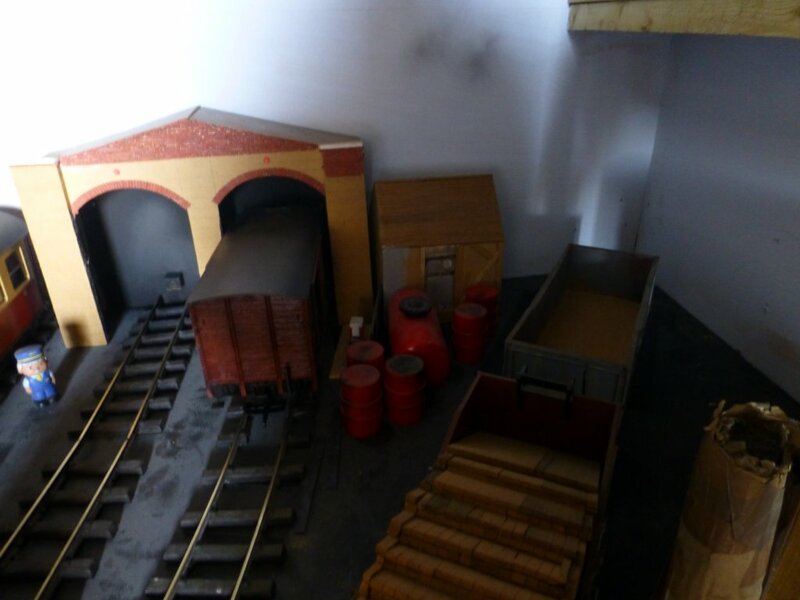 This pic shows the awkward location of the site, I wanted to go right into the corner as the Track is used to store stock when the layout is resting and every inch counts! 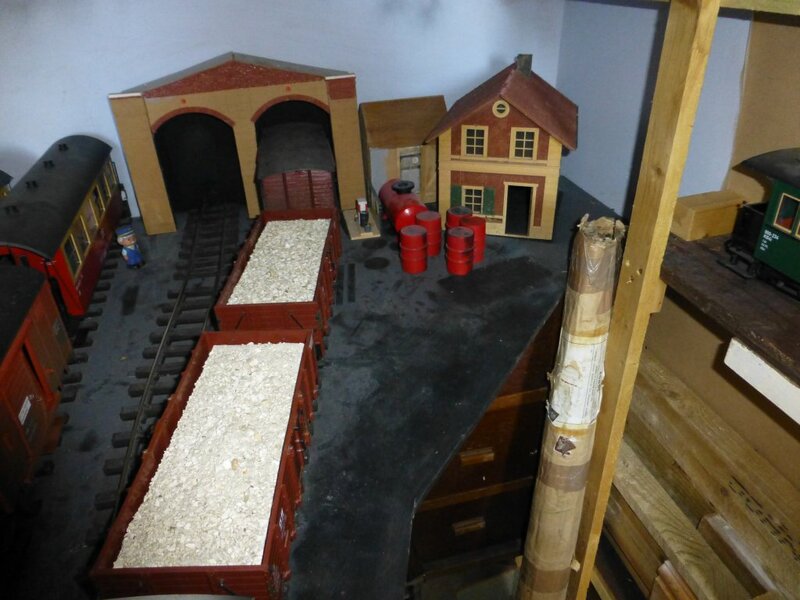 Note also the Peco Sleepers nailed into the baseboard, these define where the building sits but will also be used for the inside floor to sit on later. Starting to take shape now, note that I have scribed all the brickwork and cut out the Windows. Seen from outside the doors are where no brick has been scribed. The edges will be Grey as on the real thing. Funny looking shape can be seen here. 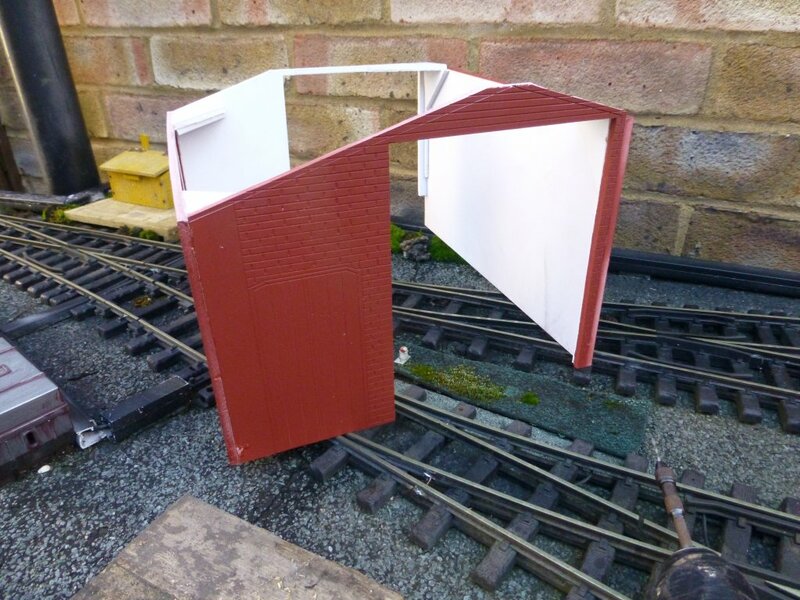 It is all a bit flimsy at this stage due to the low roof profile and little meat on the cross members. 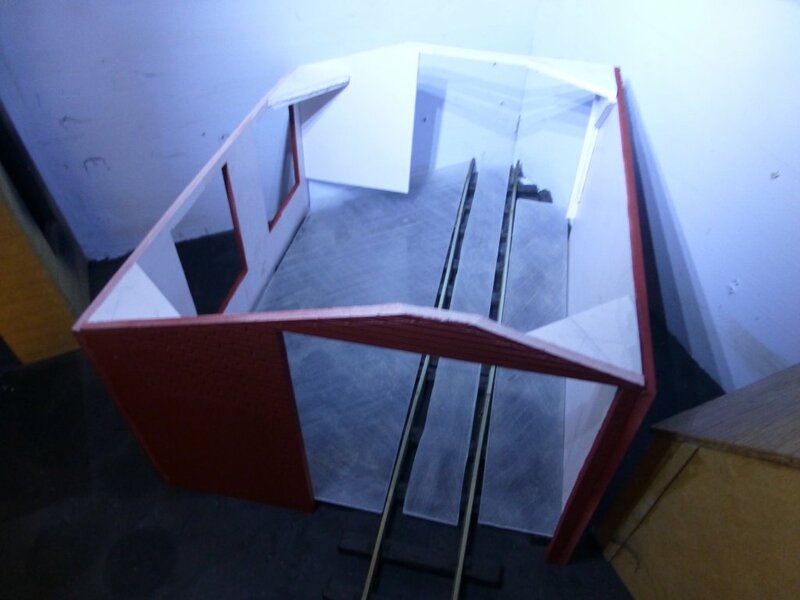 Next the flooring has been started, I use 2mm Plastic Sheet obtained from BnQ on old gits day. Not cheep but a sheet goes a long way. I use the Yellow Cutter pulled towards me called a Squaker I think, well that is the noise that it makes when cutting. 4 or 5 passes is enough to make a deep score so that the Plastic can be bent to split. These tools are very unlike a knife and the only way to properly use them is to pull towards you, not the normal way to cut with a blade. Next I sprayed with Gloss Black (a cheep crummy pound shop works very well as it is rather sticky). 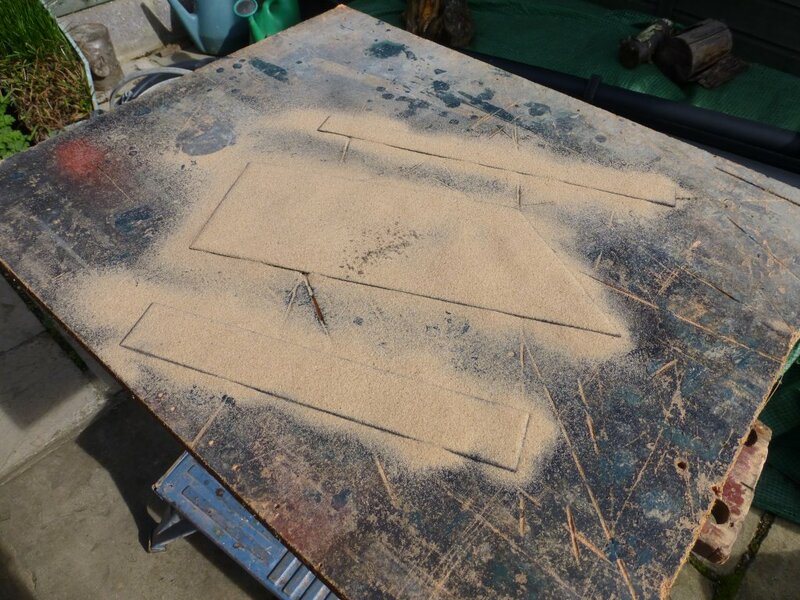 Block Paving Sand (or other Kiln Dried Small Sand) is spread over the paint while wet with a flour sifter. Once dry the surplus is shaken off to be resprayed with Matt Black Halfords rattle can. Finally fitted into place in the Workshop note this sits nicely on the Peco Rail Chairs and just clears the Rail so that Track Cleaning is not affected. 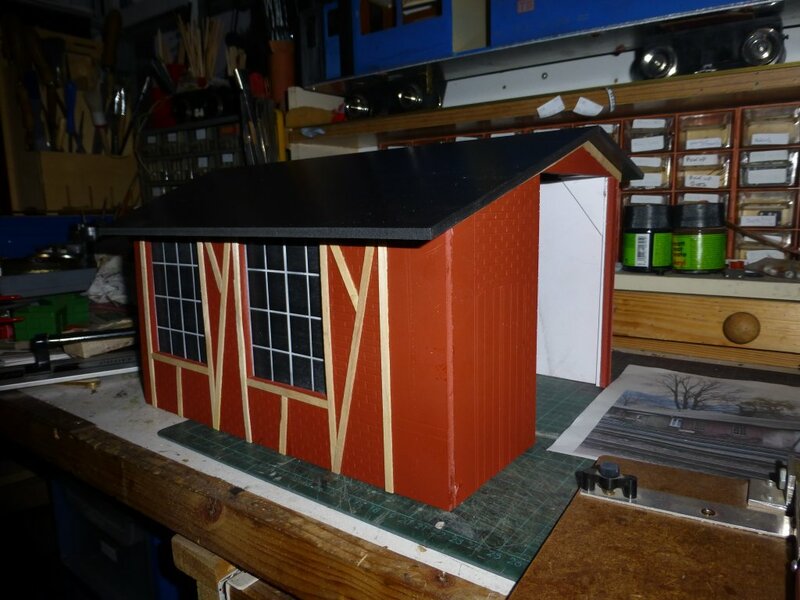 The roof was cut by first roughing up with Cardboard, additional bits were cut and sello taped to each other till a perfect profile was ontained. 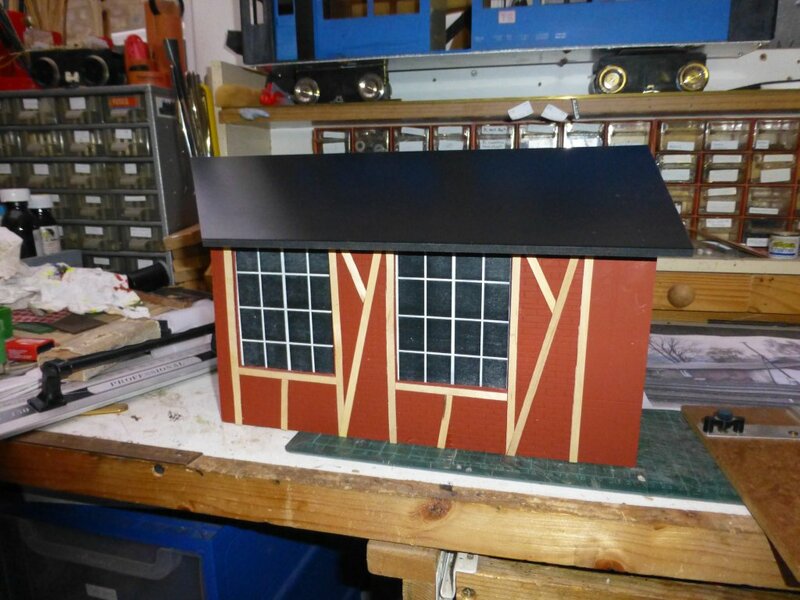 This was then used to cut out the Black Hips for the roof. A deep score down the join line allowes the bend to be put in before it was glued to the shell of the building. Another test fit of a Van. Finally showing the fit into the corner of the Shed. Back on the bench the woodwork has been added using ever faithfull Coffee Stireres cut on my North East Chopping Tool. 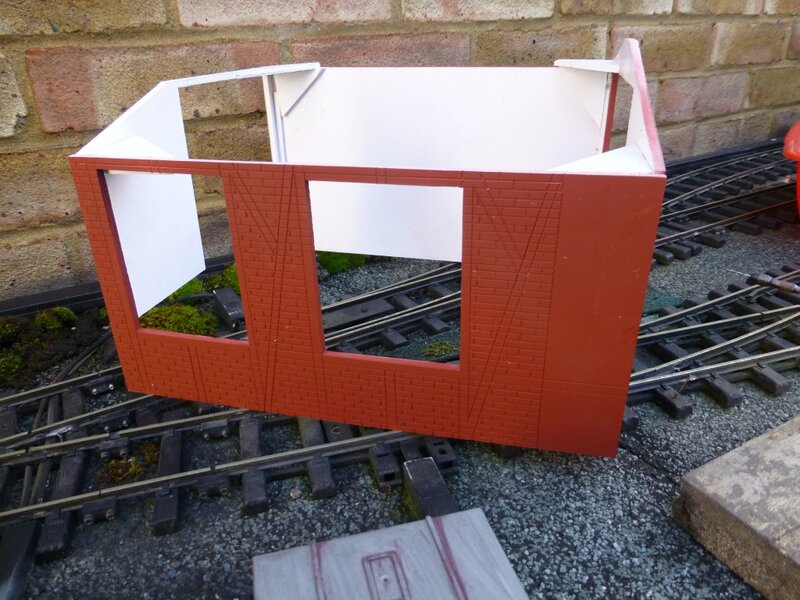 All that is needed now is to attach the doors, paint the smaller doors, paint inside probably Matt Grey weather up the woodwork and pick out the bricks somewhat with also some Mortar definition. By comparing this pic with the one of the real thing you can see the liberties taken. Decided to reshow the original, what a liberty taker of the prototype I am!